If An Ice Cold Beer Were A Shirt, This Would Be It. When these arrived at our command center warehouse in a cul-de-sac, we immediately knew a few things – the material’s so soft you can run a marathon without band-aids on your nips, a stretchy fabric that makes Stretch Armstrong seem inflexible, and a beer pocket that will turn you into an alcoholic. What Else Can You Stuff In It? 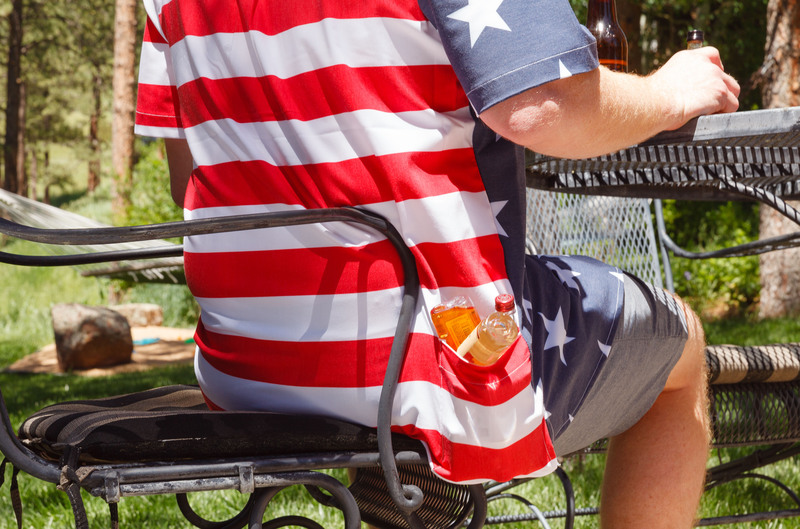 When stuffing a beer pocket, you want both quality and quantity. The essence of a Colt 45 captures pure quantity, but the quality comes from the hands-free holster. If there’s anything the ole man taught us, it’s that nothing takes the edge off a social setting like a quick nip. However, that quick guzzle turns into a whirlwind of a day when you’ve taken down 8 without anyone noticing. Hot dogs go quickly ’round a BBQ. One minute you’re in pure bliss and the next you’re lonely, drunk, and naked at the mercy of the grill master who has but one dog to give. If Dave Chapelle’s taught us anything, it’s that when you cut a hole in a popcorn bucket, good things happen. Sadly, that’s not the case here. You’ll just lose all you’re popcorn leaving a trail to your exact whereabouts.